With more of our lives increasingly taking place online, the issue of privacy, especially in regards to our personal data, has never been more important. Without even knowing it we broadcast a wide range of information about our locations, habits, interests, and beliefs just by carrying a smartphone in our pocket or using the web. This data isn’t lying fallow in digital fields though; it’s being collected, collated, and used to build detailed profiles so that companies such as Facebook, Google, and even our own governments can know more about us than ever before. 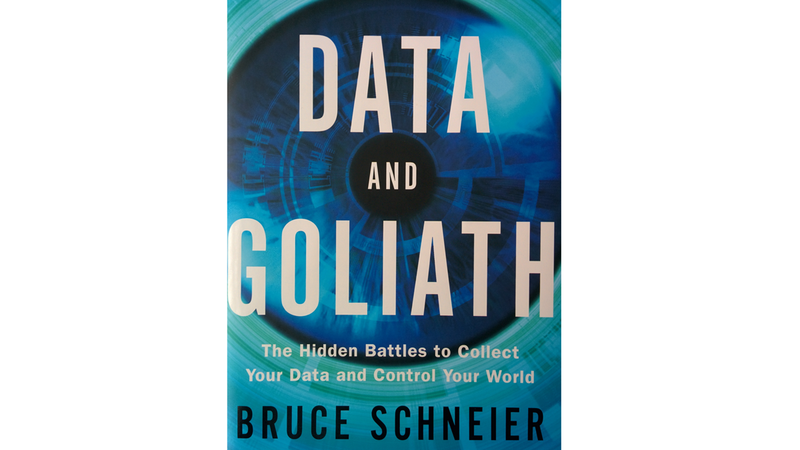 Bruce Schneier has been a specialist in the data security industry for many years, and in Data and Goliath he expertly outlines the way in which we are being monitored and analysed by a variety of interested parties. Unlike some other books that cover this subject, Schneier is careful not to invoke histrionics or sensationalism in order to sell his story, instead he calmly explains how tracking works and why it is used so widely. From its origins in the cold-war, he charts the way that government agencies regularly spied on their enemies (not to mention each other), and how this eventually transformed into the digital surveillance culture that Edward Snowden so spectacularly revealed in 2013. Schneier actually handled some of the famous Snowden documents while working with the Guardian newspaper, and even interviewed the whistleblower after he sought asylum in Russia. Data and Goliath is a fascinating exploration of this post-Snowden world we live in. It shows how the back-doors that technology companies were forced to implement for the NSA, have actually become weapons for other agencies and hackers to use. We’re taken through the murky world of international espionage, and shown how we have all become collateral damage in this digital arms race. Schneier also explains that even when we try to protect ourselves by leaving Facebook or Gmail, the fact that our friends and relatives still use them means we’re caught up in this global informational dragnet. I’ll admit, at times the book leaves you with a profound sense of hopelessness, as fighting against powers so strong appears an exercise in futility. But all is not lost. In the final third of the story, Schneier outlines his manifesto for how governments, corporations, and individuals can change they way they act, thus restoring some kind of trust to the online world. Sadly this is also one of the slowest part of the book, as the governmental and corporate sections really feel more like a utopian call to arms than an actual solution. Data has become so valuable that the prospect of them surrendering it for the greater good seems a distant and unrealistic possibility. Tips on how individuals can at least obfuscate the data we generate is useful. Schneier advocates software such as the Tor browser, HTTPS Everywhere, plus other helpful tools. He also has some ingenious ideas about throwing in random behaviour to mess with the algorithms that predict our patterns. In the end you’re still left with the knowledge that big brother really is watching, and won’t be stopping anytime soon. But at least if you’re aware of the facts it could help you make better decision about how much you, at least willingly, share. It might not be a happy read in a lot of ways, but it is an important one. Data and Goliath is published by W.W.Norton in the UK and USA.